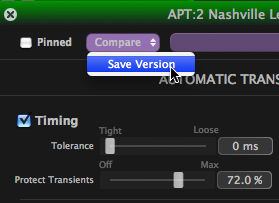 Multiple versions of a Process can be saved and the resulting audio from each saved setting rapidly compared. Note also that if a track is copied then all versions of a process associated with it will be copied too. Once you have settings of a process you want to use for comparison, in the Process Control Panel use the purple Compare drop-down to select Save Version, after which it will appear listed as A, B, C, etc, depending on what has already been saved. This can be saved again, as above, resulting in a new version with a new letter. To compare saved versions, either select one using the drop-down Compare menu or use the Q key on the computer keyboard to switch rapidly between successive versions. The currently active version of a process can be deleted using the contextual menu accessed by right clicking the relevant process control track. 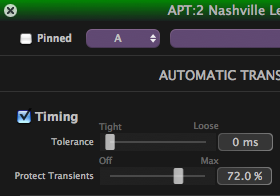 You can also delete the current version using an option in the Compare menu of the Process Control Panel.